Start the program and check out the different coding blocks on the left. Each type of code block has a unique color. In the next step, you either select a predefined sprite, or you can also draw an object yourself. Use the buttons above the object-area (where all the objects are listed). If you want to add programming to an object, make sure the respective object is highlighted in the object-area. Programming blocks can be put together in the assembly area. In the stage area you can immediately see the effect of your programming on your object. In order to start the program, you have to trigger the starting condition, for instance, clicking on the green flag in the upper right corner of the stage screen. The opportunity for storytelling by animating drawings and objects provides multifaceted links to the intercultural neighborhood. 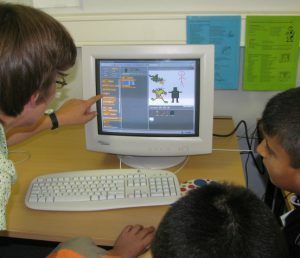 The engagement with Scratch does not only convey programming skills in a playful manner, but also allows for creatively presenting personal interests and for addressing topical issues and everyday life experiences. Since Scratch is Freeware, it can be downloaded and used free of charge. Also the related online community platform (https://scratch.mit.edu/) can be used complimentary. Varies according to complexity of the projects and age/experience level of users. Projects can be accomplished within hours, but programming activities may also cover several weeks. From our experience, group work of young children may be supported by closing the projects sessions with a common “museum-tour”, during which the children may present their ideas and state of the art of their creations. This approach does not only allow for presenting and commending project progress, but also for finding problem solving strategies and to support mutual learning. A great variety of Scratch projects can be found online at the Scratch community platform (https://scratch.mit.edu/). In order to download the Scratch software, just click here. For an overview on how Scratch can be used for learning support, please go to ScratchED online community.